Mix the contents of this jar with butter and eggs for a bourbon-soaked piece of pie heaven. For the first and only time, the phrase "easy as pie" is actually true. 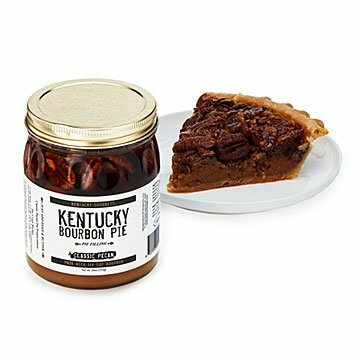 Mix the contents of this jar with butter and eggs, pour it into a crust, and you have yourself an authentic, bourbon-soaked piece of pie heaven. Made from quality ingredients, the 26-oz. jar makes an irresistible hostess gift or a treat for the busy home baker. And if pie isn't your indulgence of choice, the sauce can be served warm over ice cream, poured over baked brie, or used to bring a shot of Southern hospitality to all manner of recipes. Made in Kentucky. Just add eggs and butter and pour into your favorite pie crust! It was so quick and easy, wish it was a bigger jar, or I should have bought 2! I made small tartlets instead of big pie, it went further. And also had over custard, good Wisconsin custard, like a turtle sundae. Was a bit skeptical because it does contain bourbon. You can taste the bourbon but it is a delicate flavor. Everyone like it. Bought several to give for gifts, and tried one for Thanksgiving. Easy as pie and yummy! This is a delicious, gourmet filling. Better than I expected. All loved it and made me promise to make it again this year. Tastes home-made! Called for 5 large eggs. I used 5 jumbo eggs and it overflowed the pie tin. Tasted just right - not too boozy. Wonderful mix. I will buy more. So easy to make! It turned out delicious. More than enough to fill a Pet Ritz pie crust, so I made sure to ladle out all the pecans and ended up ditching about a 1/2 cup of the remaining "liquid". Added pecan pieces to the top and baked...husband loves a lot of pecans. It was perfect! Bought this last year as one of many Christmas desserts. My family loves pecan pie but we all agree that it should not be sugary sweet as most are. Folks, this pie is perfect! My son, who is a foodie absolutely could not get enough of it! Buying two jars this time before they're gone! This stuff is delicious. I can't imagine wasting my time trying to duplicated this goodness from scratch. Besides a pie, I even went as far as basting some peaches with it, then grilling them, served with a scoop of ice cream and topped with a little more of the pie filling. HEAVEN! Next attempt will be a pie but with a bacon for a little extra yumminess.